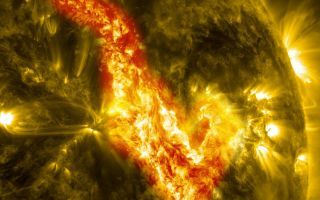 A magnetic filament of solar material erupted on the sun in late September, breaking the quiet conditions in a spectacular fashion as seen in this amazing space wallpaper, dubbed a “canyon of fire” by NASA officials. A magnetic filament of solar material erupted on the sun in late September, breaking the quiet conditions in a spectacular fashion as seen in this amazing space wallpaper. The 200,000 mile long filament ripped through the sun's atmosphere, the corona, leaving behind what looks like a canyon of fire. The glowing canyon traces the channel where magnetic fields held the filament aloft before the explosion. In reality, the sun is not made of fire, but of something called plasma: particles so hot that their electrons have boiled off, creating a charged gas that is interwoven with magnetic fields. The image was acquired on Sept. 29 to 30 by the Solar Dynamics Observatory. NASA officials dubbed the solar view a “canyon of fire” on the sun.